Price: FreeThis is another big interfaced senior friendly app launcher and it is absolutely free. This launcher comes with large colored icons to help seniors operate the phone without any stress and fear of making mistakes. Its ‘one screen operation’ which provides everything within hand’s reach and simple UI is ideal for elderly operation. 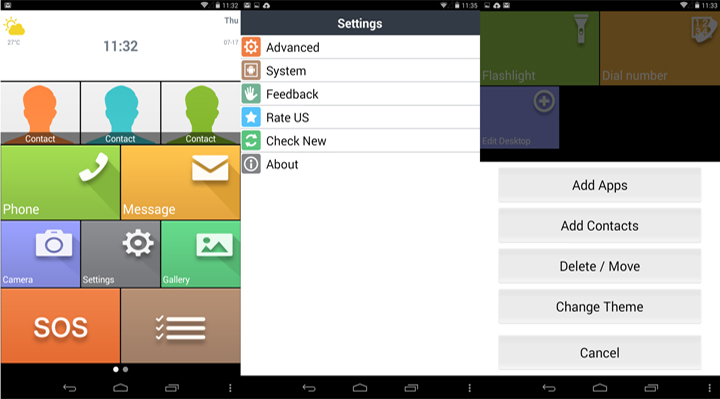 The home screen can be loaded with big colorful icons which are frequently needed such as favorite contacts, dial, SMS, camera, settings, gallery, SOS, etc. Moreover, it also includes some themes. You can get it here.